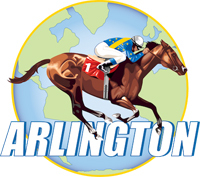 Join the HBSCC, HCC, Wharton, and PENN Clubs at Arlington Race Park for a fun afternoon at the races! Enjoy delicious food, fun, and libations, and watch the horse races, meet new friends and have a grand time! Join us on the Miller Lite Deck with premium indoor and outdoor seating. Included is a 2 hour Chef’s Table menu which includes Caroline Rib Tips, Southern Baked Chicken, Slow Smoked Beef Brisket, Jalapeno-Cheddar Cornbread, creamy cole slaw, “Hoppin’ John” salad and a cookie assortment. Beer and Wine included. The Miller Lite Deck is an indoor/outdoor venue with casual seating plus access to grandstand seats and patio space for live race viewing. There are self-serve wagering machines located inside the venue. There is a “Behind the Scenes” PADDOCK TOUR - Watch horses being saddled in the Paddock while the trainers and jockeys plan their strategies. One of our expert wagering hosts will explain everything you need to know about Thoroughbred racing. Paddock Tours: 1 pm and 3 pm - $10 per person. Limited # of tickets – first come, first served! The link will take you to eventbrite to sign up.